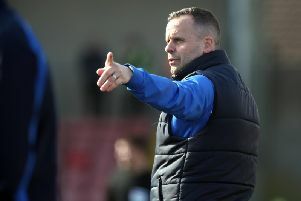 The deflated words of Coleraine manager Oran Kearney following his side’s 3-0 humbling as Stephen Murray scoredtwice as bottom club Warrenpoint Town secure their second league win of the season last Saturday. Kearney blasted: “I said to the lads, in the brief words that I said afterwards, number one, none of you have done anything, number two, the big opportunity that we had this season against Ards in the semi-final, they didn’t produce on either so how dare you come places like this and think it’s only a matter of just turning up. “When people start patting you on the back and telling you well done, you relax a bit more and I think we’ve had that conveyor belt of well dones and pats on the back and maybe there are people who have taken their eye off the ball or their foot off the pedal. “The one thing I pride myself on is work rate and how hard we work, and today it wasn’t there. It’s not that we’re not fit. The Bannsiders manager said the home side fully merited their victory and added that they did not look like a bottom of the league outfit. With Glenavon drawing 3-3 with second placed Cliftonville, Coleraine lie two points behind the Reds and a point adrift of third placed Linfield, having played a game more than the Blues. “The longer the game goes, the more chance they have,” said Kearney. “Fair play to them. I wouldn’t say they stifled us in the first half because there wasn’t that much to stifle. “But they were well organised, they worked really hard for each other and didn’t look like a side that are bottom of the league. “At 2-0 we have those three chances in a row and then a big penalty shout. Jamie has cut round the guy and he’s taken his standing leg and the referee’s assistant, who has been very active all game, doesn’t flag for that one. “The referee was in a good position and it looked like a stonewall penalty from where I was. “You take those four scenarios, for as bad as we were today, if we had got our goal even at 2-0, we had to ask questions and give them something to panic about. It was too plain sailing for them today. “We gave them a couple of scares and if one of those chances goes in we would be standing here talking about a different game. “It would have been the shot in the arm that we needed and it would have kicked us on to go and get something out of the game.